Wine critic Robert Parker has described our Storybook Mountain estate as “One of the steepest, most picturesque vineyards in California.” Located at the top of Napa Valley four miles north of Calistoga and just a quarter-mile from the Sonoma County border, our estate vineyard reaches elevations approaching 2,000 feet on an eastern slope of the Mayacamas Mountain Range, creating an ideal eastern exposure characterizing many of the world’s most acclaimed vineyards. The vineyard is divided into over 100 separate micro-blocks based on grape variety, sun exposure, rootstock and clone. Open to the morning sun, the vines easily ripen their fruit, yet their oblique angle to the hot afternoon sun tempers the heat spikes and heat accumulation that can bake grapes, leading to overripe flavors. Furthermore, the Russian River to the west funnels cooling afternoon breezes to our vineyard, resulting in temperatures often ten degrees cooler than in the valley below. Rainfall patterns in our northernmost section of Napa Valley also contribute to our estate vineyard’s singularity. 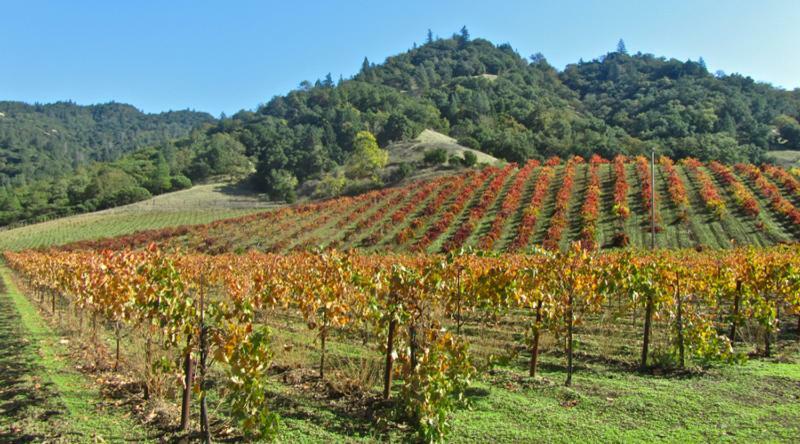 During spring, the area north of Calistoga is among the rainiest in Napa County, often receiving twice as much precipitation as the cool-climate Carneros district in the southern end of the valley. This amount of moisture – given our vineyard’s relative coolness and clay soils – means that most of our mature vines do not require irrigation, a blessing especially during drought years. Water conservation, however, is just one element of our commitment to sustainable farming. We are a certified organic vineyard and thus refrain from the use of insecticides, pesticides and commercial yeasts, instead using environmentally friendly farming techniques reflecting our determination to be responsible stewards of the land.